In a medium bowl, pour boiling water over the cocoa powder and stir until smooth. Let cool for 15 minutes. Meanwhile, preheat oven to 350F and line 2 muffin tins with cupcake papers. In a large mixing bowl, cream together the butter and sugar until light and fluffy. Add in eggs, one at a time, until the mixture is consistent and pale yellow. Mix in the vanilla and peppermint extracts. Working in 2 batches, blend in the dry ingredients and cocoa mixture alternatively. Fill cupcake papers 2/3 of the way full and bake for 16-20 minutes, or until cupcake is set. Whisk together egg whites and sugar in the bowl of a stand mixer. Set bowl over a small pot of simmering water and whisk constantly until the sugar dissolves. You know it’s ready with the you cannot feel the sugar when you rub a small amount of mixture between your fingers. Switch over to the paddle attachment and set the mixer to medium speed. Add the butter 2 Tbs at a time, letting it incorporate before adding another piece. Turn the mixer up to medium-high speed and beat until the frosting comes together. This will take a while, so don’t worry if it looks soupy or curdled at any point. I find that it helps (if it’s not cooperating) to briefly chill in the fridge for a few minutes and then remixing. Mix in the vanilla and peppermint extracts. Place half of the buttercream into a small bowl. Set aside. Using the remaining half of frosting in the stand mixer bowl, mix in red food coloring. Place your piping bag, fit with a large star tip into a tall glass. Cut a piece of card stock in the shape of the glass to divide the bag into two sections. Place the white buttercream in one side and the red buttercream in the other. Pipe a few test swirls until the frosting comes out both red and white. Pipe cupckaes as desired. 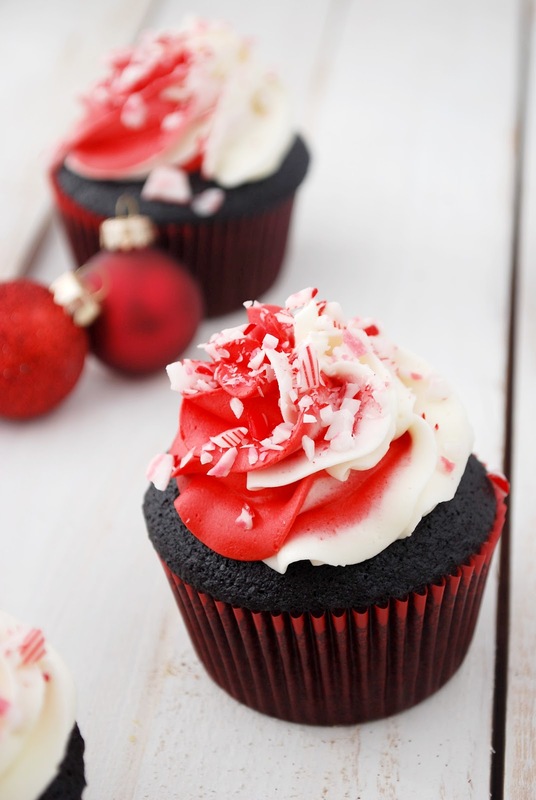 When you’re ready to serve, sprinkle cupcakes with crushed candy cane pieces.